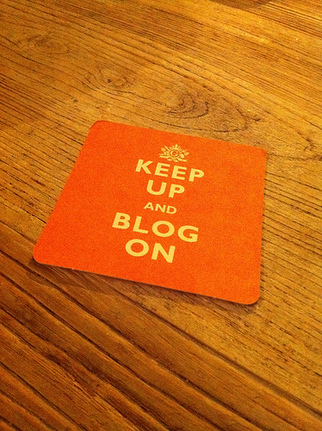 Most small business bloggers crave a consistent, loyal blog following. They want to speak to an audience and be heard, heralded as the next great industrial visionary or at least a voice of importance. And yet, more often than not, such ambitions can be hard to achieve and at the least can take time to build. So it’s little wonder that many SME bloggers can get frustrated by the process especially when they are unsure how many people are really engaging with their message. At such times the blogosphere can seem a very large, daunting and lonely place. •	Consistency of message – As the famous Churchilian saying goes ‘You can’t please all of the people all of the time.’ In fact it’s a given that people aren’t easy to please full stop. With this lesson in mind the least you can do is aim to meet your audiences expectations as consistently as possible. No matter how small that audience is to begin with consistency will bread loyalty. How often you post, the quality and style of your posts are all essential elements of this mix. Balance these three points well over time and you’ll be surprised at the results. •	Focus – whenever possible write posts that reflect a deep understanding of your field of expertise. Write up tutorials for the novice, intermediates and experts in your niche. Talk to each audience in turn through a series of posts. This will ensure you avoid jumping from topic to topic and confusing your reader base whilst providing specific insight catered to different levels of understanding. The engagement that should result will see your blog gradually becoming a focal point for conversation in your niche. Stay focused and consistent in this regard. • Seek out your audience and engage them on other sites – when you really want to build a large following you need to invest a little time hanging out in some established blogs, forums and sites that are particular to your niche. Join the community and contribute to the conversation. Through the process of participation people will start to appreciate your insights and will voluntarily head back to your blog to read more of your views. NB: DO NOT, whatever you do, just barge into someone else’s site and say “Hey everybody, come over to my site as you will get more out of it”. Firstly it’s not cool and you will be seen as being arrogant and above the fray, and secondly it shows disrespect to your host who could well prove to be a valuable contributor to the conversation on your blog if engaged in the right way. Courtesy goes a long way in niche communities. •	Respond to Comments – only a fraction of readers leave comments on what they have read. As such you need to show appreciation to those who spend the time leaving messages on your posts. This tactic both engages your audience and moves the conversation along. By posing questions in your responses you can develop secondary and tertiary debates to further develop the debate. By adding such value to your site you will build loyalty among your readers. •	Write Compelling Post Titles – post titles play an essential role in engaging your audience. If you have interesting and/or enticing post titles they will draw in more readers. Leading questions, statements and famous names can all play apart. Just remember that compelling titles attract readers attention in ways that are sometimes hard to fathom so spend time thinking up the best possible and you will be rewarded. •	Give It a Little Time – no blog can gain a thousand followers in just a day, well, unless you are Hollywood superstar. So be patient, stay on the straight narrow and really put in the time producing great quality and unique content. Build up those relationships with loyal readers and word of mouth will play an important role. You can utilize social media to help you expand your sphere of influence and entice your audience to retweet, facebook share, bookmark and whatever other channels you fancy to get your message out there. These are just guidelines but I truly believe that with enough patience and application anyone can build up a loyal blog following. Just bide your time and stay true to the above and you’ll see your way there. This is a guest post written by Josh Aggars. Josh helps to run a small ecommerce store selling mens flip flops in the European market. Connect with him at facebook.com/josh.aggars at any time for blogging tips and advice. This entry was posted on Wednesday, July 6th, 2011 at 8:00 am	and is filed under Selling Tips. You can follow any responses to this entry through the RSS 2.0 feed. Both comments and pings are currently closed.